I’ve worked for the Indians for close to 6 years now and I have to admit that every time I go up the steps behind home plate to get to the field, or make the turn in the lower level to walk out the elephant doors in left field, I still have that moment of awe. There is nothing like the feeling you get when you are about to go onto a professional sports team’s field. It’s a feeling of excitement and calmness mixed in with heart pounding joy. I get to do it every day and anytime I want, yet that feeling never fades. What makes it even cooler is when I can take someone out to the field who would have never dreamed they would have the chance to be that close. 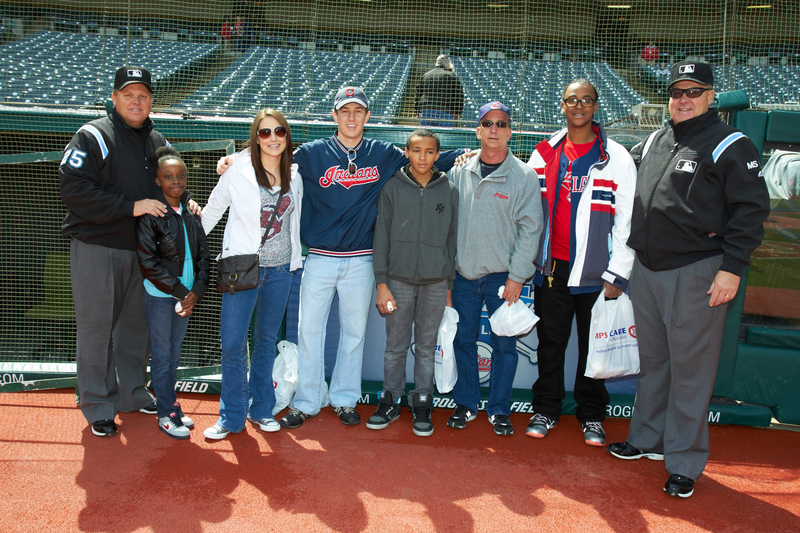 Fabian Washington from Cleveland, Ohio was able to experience the sensation on an even grander scale at his recent trip to Progressive Field. 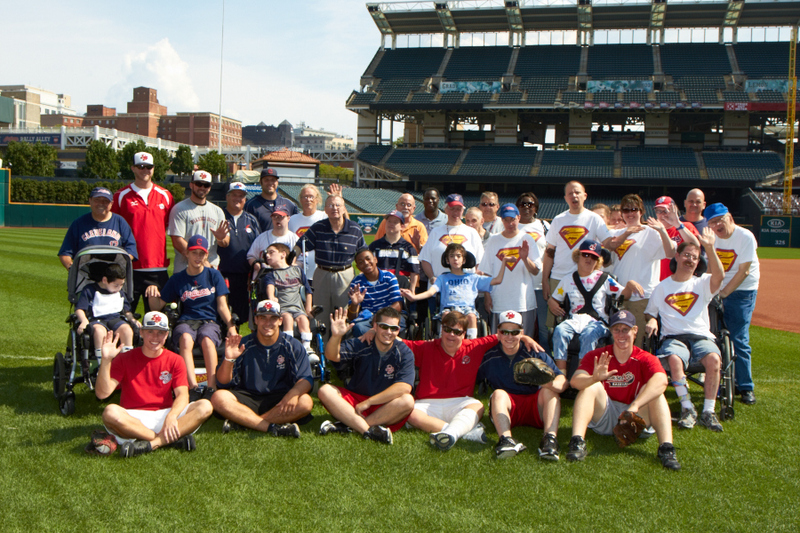 The Cleveland Indians teamed up with Strike Force Baseball Academy and the Diamond Boys Organization to hold a “Dream Day” at Progressive Field. The two groups worked together to put on a baseball clinic for children and adults with developmental disabilities who have never really had the chance to play sports. “I learned how to hold a baseball properly, I learned how to hold it across the ‘U’ and not just hold it any sort of way. It’s just awesome to come down here. I”m having lots of fun just playing around on the field…and I love the fresh grass,” says Fabian. The day ended with an intrasquad game before they broke for lunch. The participants used the skills they learned to play their very own game of baseball. They played on the same field where their heroes play. The helmets were the same ones that past Indians players have used. The balls were Major League baseballs and the grass–well, like Fabian said–it was “fresh”…just like the pros play on. To learn more about Our Lady of the Wayside and Rising Star, visit their websites at www.thewayside.org and www.risingstarlc.org respectively. Eighteen years ago I got into this “runner craze” that was taking over. I shouldn’t say it was taking over because in actuality I was probably in the minority choosing running as my sport instead of football or baseball or basketball. I like to say that running was only for the cool kids back then. I mean, I run and how cool am I? I had one famous runner to look up to (Steve Prefontaine) instead of having to worry about remembering all of those other big sport athletes’ names like Michael Bird of the Boston Bulls or Brett Montana of the famous Green Bay 49ers. As I grew older and got out of school, I noticed that all of the people who used to make fun of us cool runner kids were actually starting to run themselves (I was definitely ahead of my time with this sport and knew it would take off one day). Guys who used to play football were now running 30 or 40 miles a week. Lazy people from my school are now running in the same road races as I do! It got me thinking…what if there was a race that was not only competitive, but also enjoyable for all of those former football, baseball and basketball players who have now taken up running? A race where Joe Fan and Lazy Larry could get a workout in, while at the same time experience something that not many people get to experience (and I’m not talking about Runner’s Nirvana). 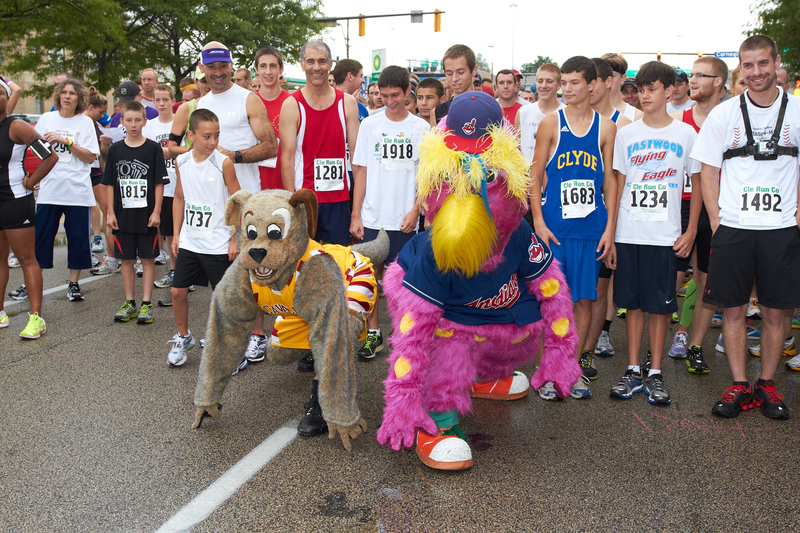 My quest to create such a race came full circle on July 15, 2012 when Cleveland Indians Charities, Cleveland Browns Foundation and the Cavaliers Youth Fund joined forces for the first time ever and put on the Inaugural FANtastic 4-Miler! The race, presented by the Cleveland Clinic Sydell and Arnold Miller Family Heart and Vascular Institute, took runners into Cleveland Browns Stadium and around the football field, into the “Q” Arena across the Cavs court area and finished on the warning track of Progressive Field. All proceeds were split between the three sports teams’ charitable foundations. The race sold out at 1,000 runners. We saw the overall male and female runners finish in 20:41 (Mike Capriolo) and 23:22 (Kelly Green). The overall winners received an experience package from each team and the top 3 winners in each age group received either a pair of Indians, Browns or Cavs tickets. The race drew the likes of former Indians pitcher and Sports Time Ohio pregame host, Jason Stanford, and his fellow STO co-workers Dave Chudowsky and Katie Witham. 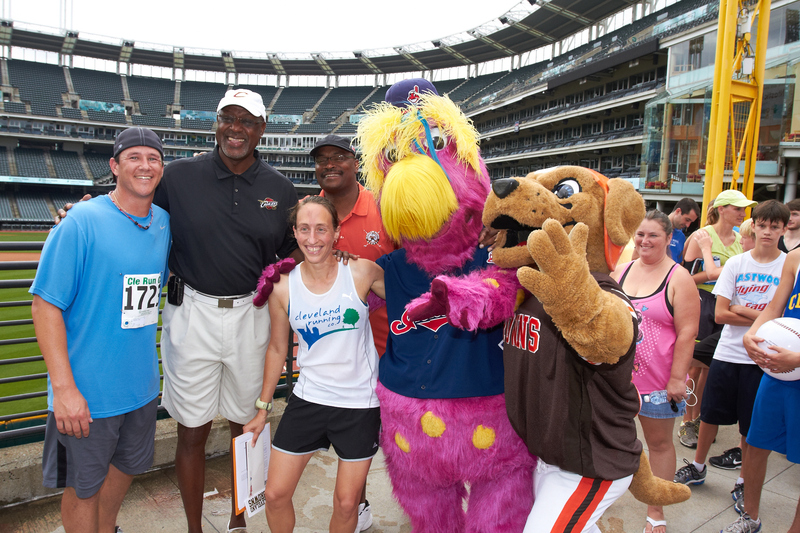 All three competed in the race, while Browns alumni Reggie Langhorne and Cavs alumni Campy Russell cheered on the runners from the sidelines. Of course, for the non-runners out there, the Cleveland Clinic Children’s Hospital stepped up and sponsored a post-race family walk around the warning track. It was a nice way for the runners and their families to cool down, burn some calories and share their race stories while walking around Progressive Field! Congratulations to all the participated and thank you to all of the sponsors who helped make this race a success! Kids nowadays do things extremely different from how they used to do them when I was young. For instance, when I was young, I used to have to get up and change the channel for my parents because our old TV didn’t have a remote control. Luckily, we didn’t have cable so we only had 4 channels to flip through. Kids in my day also had to call our parents via 1-800-collect to come pick us up from school if we didn’t have 25 cents for the pay phone. If we were really smart (like I was), we would call our parents collect and instead of saying our name to the operator (so the parents would accept the call and the charges) we would say “come pick me up” really fast. That way, our parents knew to pick us up and we wouldn’t have to pay for a collect call. You’re welcome Mom and Dad. Anyway, another thing different was when I would play kickball at school, it was played with one goal in mind…to beat the other team. 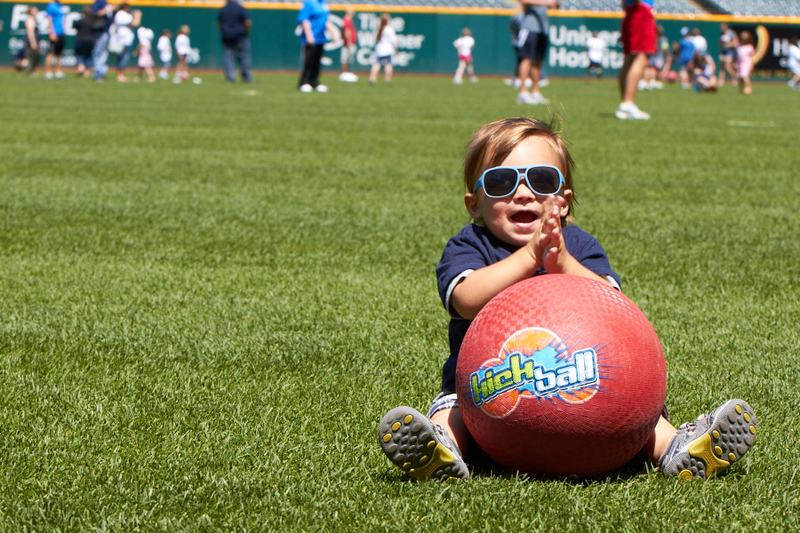 These days, kids are playing kickball for a whole other reason–to raise money for pediatric cancer research. It’s crazy! Kids are helping out other kids through the game of kickball! I guess it really isn’t that crazy. Kick-It was founded by a 10-year old cancer patient with a big dream- to cure cancer by playing kickball. Now a national fundraising program, Kick-it raises money for pediatric, adolescent and young adult cancer research. 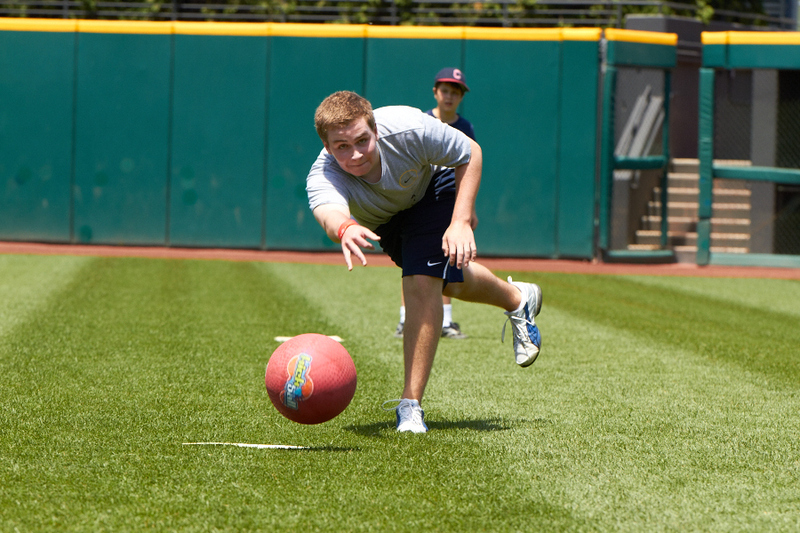 Throughout the year, groups of kids hold kickball games and if they raise a certain amount of money they are invited to play kickball on Progressive Field! 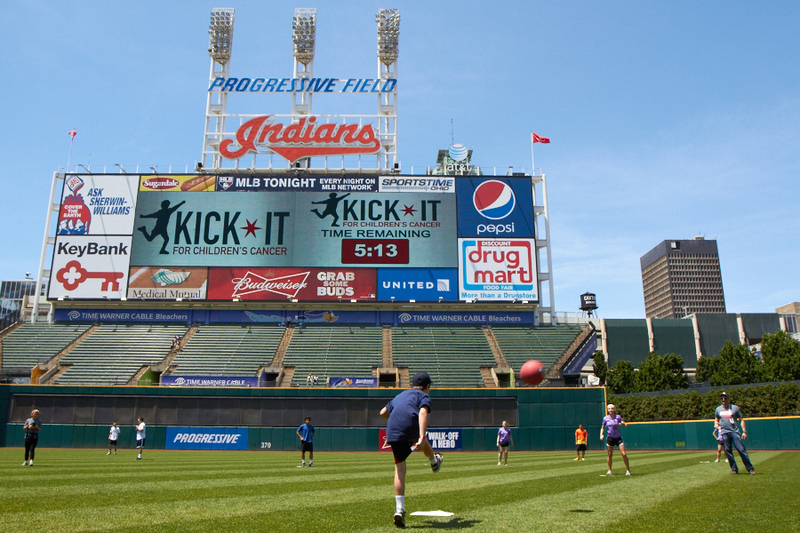 Recently, Kick-It and the Cleveland Indians teamed up to bring 36 teams to play throughout the day on the same outfield that their favorite Indians players play on. 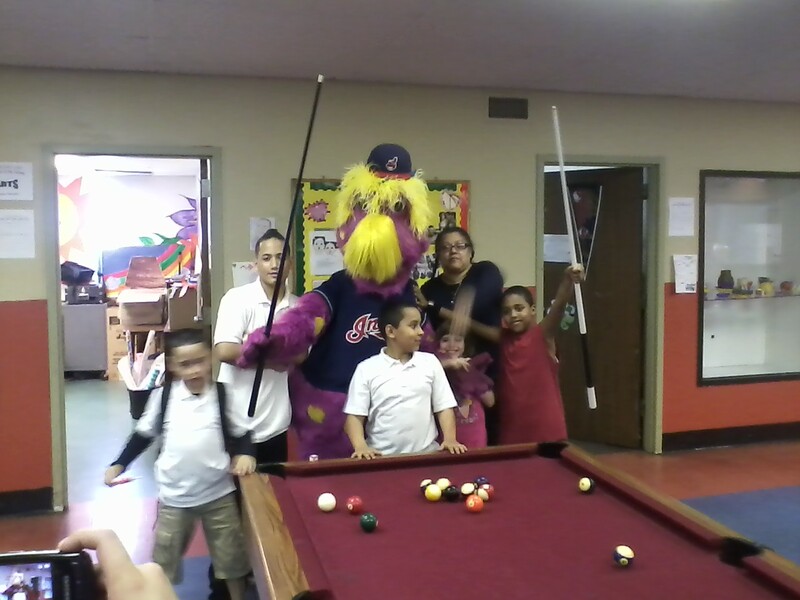 The Cleveland Indians have supported Kick-It since its inception. Cleveland Indians Chairman and Chief Executive Officer Paul Dolan is passionate about finding a cure for pediatric, adolescent and young adult cancer research. 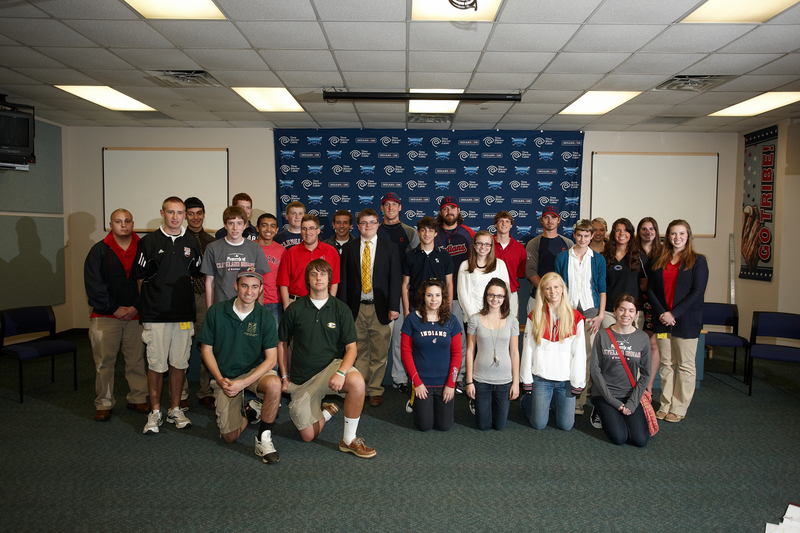 The commitment from the Indians organization allowed Kick-it to grow from a single event to a national organization. 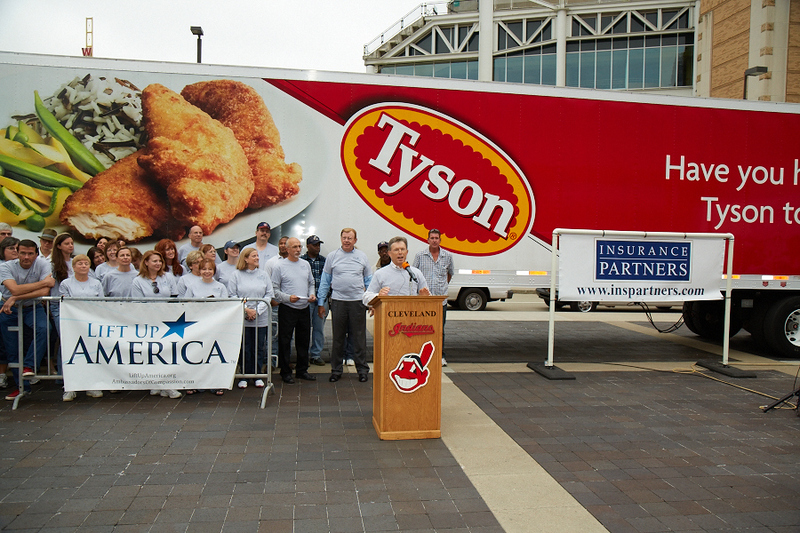 Thanks to our partnership, corporations, school teams and Tribe fans across Northeast Ohio have raised more than $700,000. (thanks kick-it.org for that information). Why make billions when you could make MILLIONS!? I was in the Progressive Field Team Shop the other day to buy a hooded sweatshirt for my future sister-in-law, who I will refer to only as Rebecca D. Actually, that’s too identifiable, so I’ll call her R. Drew instead. Anyway, she had been hounding me forever to get her an Indians hoodie (yeah, I called it that) and her birthday was approaching so I thought I might as well. I scrounged up enough Indians Fun Money (Fun Money is like Micky Mouse money…it’s not real, but you can still buy stuff legally with it) and made the purchase. The cashier gave my total as $34.88. She then asked if I would like to “Round Up for Charity.” You can see my Round Up for Charity blog entry here. 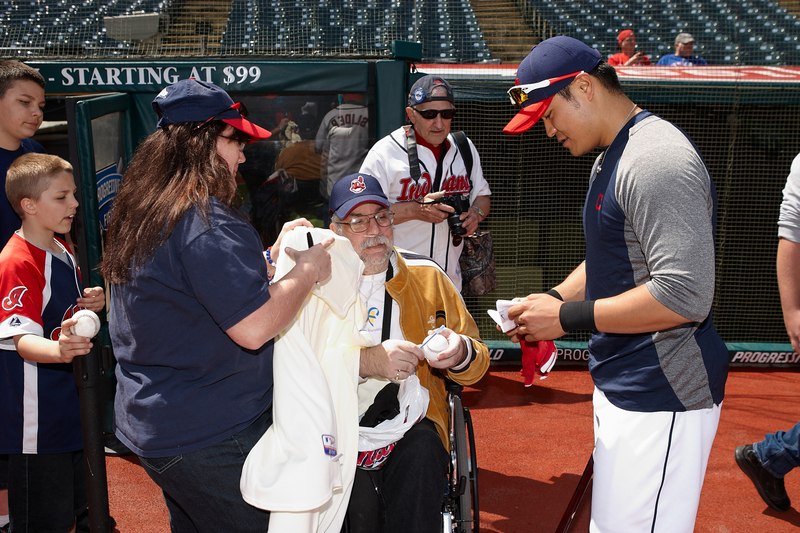 Of course I said yes, and the remaining 12 cents was given to Cleveland Indians Charities (CIC). Twelve cents doesn’t seem like much, but if everyone “Rounds Up” that accumulates to a pretty good number for charity. Round Up, along with numerous other fundraisers throughout the year allow CIC to make some amazing financial contributions. The past few days, CIC has been making headlines by donating those funds back to the Cleveland community. On March 31st, a Rally for Excellence was held at East Tech High School and was open to any and all supporters/students/teachers/parents of Cleveland Metropolitan School District. At the rally, Cleveland Indians Charities presented CMSD a check for $167,000 which will be used to continue their baseball and softball programs (which would have been eliminated along with their other Spring sports programs). The Indians and CIC continued their support of the baseball and softball programs by attending the Senate League’s season opener on April 2. The ceremonial first pitch(es) was thrown out by Cleveland Indians President, Mark Shapiro and CMSD Chief Executive Officer Eric Gordon. 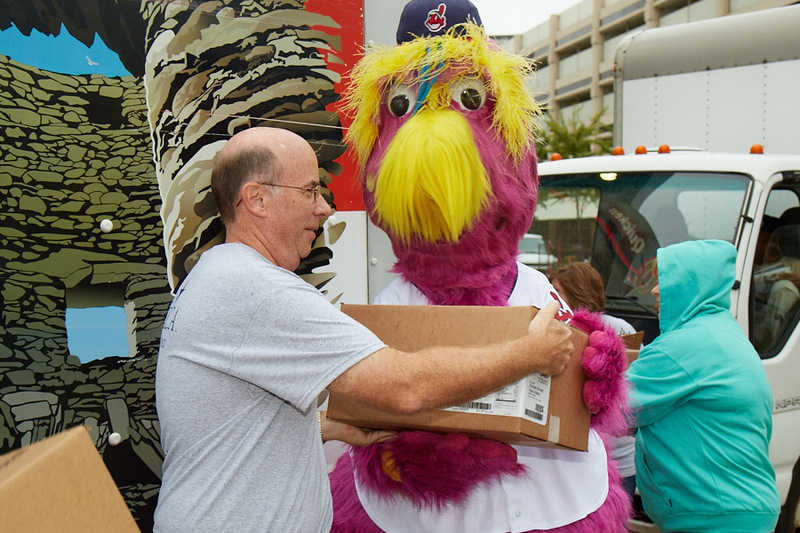 This marks the 15th season of partnership between the Athletic Department of CMSD and Cleveland Indians Charities. In those 15 years, CIC has donated over $2.4 million dollars to help operate baseball and softball programs throughout the Cleveland school system. CIC was not done yet! On April 4, Cleveland Indians Charities President and Indians Senior Vice President of Public Affairs, Bob DiBiasio along with Indians Chairman and CEO Paul Dolan made their way to the Boys and Girls Club’s Broadway Club to make the largest charitable donation in CIC history. They presented a check in the amount of ONE MILLION DOLLARS to Ron Soeder, President of the Boys and Girls Clubs of Cleveland to support their “Save Our Kids” campaign. The “Save Our Kids” initiative aims to raise $16-20 million dollars over the next five years in an effort to maximize the reach of existing Greater Cleveland clubs, add new clubs throughout the Cleveland Metropolitan School District, Breakthrough Charter Schools, and build a sustainable endowment to support the children of Cleveland. Everyone has a dream in life, or a wish that they wish would come true. My sister probably wished she would have another sister instead of two brothers. My brother probably wished I wasn’t such a wuss growing up and wouldn’t cry every time he practiced different wrestling moves on me. My friends probably wished they were as cool as me…who can say for sure? I used to wish that I would be a famous TV star. And, while I never wanted to be on the TV show “Blossom,” I will admit that I may have wished a time or two to be Joey Lawrence. He was so cool! As awesome as he was, I am pretty glad that wish never came true because, other than a great song or two (my blog title is a lyric from one of Joey’s songs), his career and stardom has pretty much shot straight downhill since “Blossom” ended. I recommend not making a wish on that falling star. There are some great wishes that are worth making realities. This past Sunday the Cleveland Indians and the great people at Make A wish and Macy’s helped inspire some kids to dream big. The immensely popular Macy’s Santa Claus made his first public stop to Cleveland (normally when he delivers presents on Christmas Eve it is more of a secret event). As part of his stop, he was able to swing by Progressive Field where he met up with Cleveland Indians players Travis Hafner and Josh Judy to hold a private meet and greet with some Make A Wish families at Indians Snow Days. 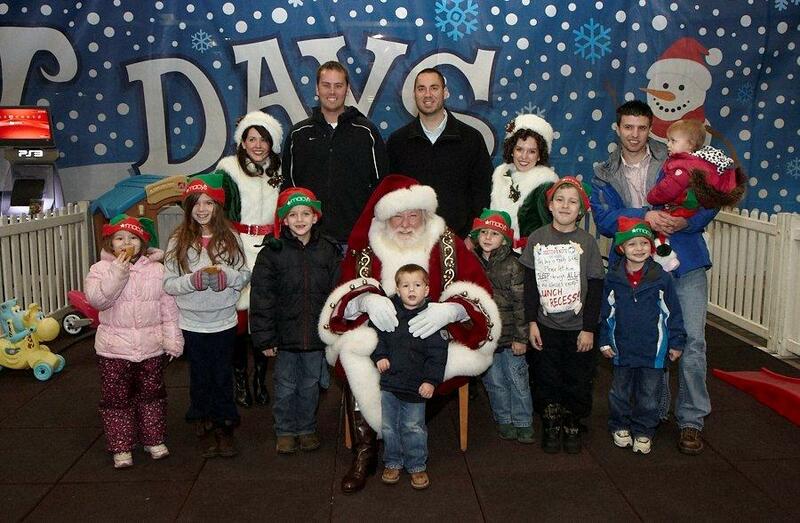 The Make A Wish families and Tribe players welcomed Santa and two of his elves (Jingle Bell and Nutmeg) to Progressive Field and had the opportunity to hang out with him, get some autographs and a few photos. They even got to enjoy the Frozen Mile and The Batterhorn (two main features at Indians Snow Days) with Santa before he had to make his way to Macy’s store at Great Northern Mall. For a visual recap, check out the video link below. Special thanks to Amy Michelson and Dan Mendlik for putting the video together.